Growing up in Wisconsin near the Minnesota border, there was a little rivalry between the states. More than once I heard the claim that Wisconsin actually has more lakes than Minnesota probably from people who had lived in the badger state for their entire life. So I wanted to check this out. Minnesota is the land of 10,000 lakes. Look at their license plates. But the state does not actually have 10,000 lakes. It has more. The official number is 11,842 lakes. So how about Wisconsin? Well, the Wisconsin department of natural resources claims that there are 15,074 lakes in Wisconsin. So Ha! But hold on. It turns out that the two states have different definitions of a lake. Minnesota's count includes only those that are all over ten acres and named. Wisconsin counts them even without a name and has no size limit. Wisconsin only has about 6,000 named lakes, even including those under ten acres. 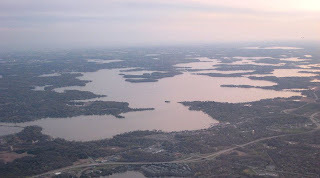 If Minnesota counted all lakes down to four acres without names, it is likely there would be over 20,000. Wisconsin may claim more, but by any consistent measure, Minnesota has more lakes. Also more lake area, not counting the great lakes that form state borders. Minnesota has about 2.6 million acres of lakes compared to one million for Wisconsin. Counting great lakes, Wisconsin jumps to 7.1 million acres, from large portions of Lakes Superior and Michigan. The state of Michigan, by being surrounded by great lakes, has over 25 million acres of water, second only to Alaska, despite having no ocean coast. Finally, don't forget about the vast expanse to the north. Whoever gave Minnesota its nickname probably felt silly if they ever made it to Canada. Ontario, Minnesota's Canadian border buddy, claims to have over 250,000 lakes, more than the entire United States. And Quebec is even more lake filled. If only counting lakes over three sq km, which is 741 acres, Quebec has almost 10,000 of these lakes: 8,275 to be exact. Ontario has 3,899. Minnesota and Wisconsin have a pathetic 318 and 240 in comparison. Quebec has 43.7 million acres of lakes, despite not bordering a great lake, 16 times more than Minnesota. Quebec is 6.6 times larger than Minnesota. Canada as a whole claims to have over two million lakes, compared to about 125,000 for the lower 48 U.S. states. Topping even this claim, is Alaska, which claims to have over three million lakes over 20 acres. Many of these are on the northern edge of the state and are seasonal and vary with snowmelt. As for large lakes, Alaska only has one larger than 1000 sq km compared to 24 for Canada. Minnesota may be the land of 10,000 lakes, but if you want to see the land of millions of lakes, just head north. Use the map below to explore some of the lakes of Canada. NEPCO Lake is wedged in between two championship golf courses (The Ridges and Bull's Eye Country Club), the Wisconsin River, and a small local airport. The reputations of the lake and Bull's Eye Country Club are legendary in the paper industry where each week for 65 years paper salesmen from NEPCO entertained their best clients from around the world. Nepco lake was only accessible if you had a card from one of the mills. No public boat landings for a long time! I used to swim my horse in the water on the north east corner of the lake. It's not true that Lake Nepco is only accessible to only mill employees. There has been at least one public boat landing since at least the 70's. Glad I came across this very interesting post. Good stuff. I grew up in Alaska, so I was aware of the extreme lake number of that state, but had no idea there were so many lakes in Canada, especially Ontario and Quebec. Wow! Minnesota is the 12th largest state in land area and is about 40% larger than Wisconsin. That would help increase there number alone. I really need to memorize this so I can school all of my Wisconsin friends. Any chance your can cite your sources so I can prove it? haha. Those Canadian provinces are also massive compared to any US state other than Alaska. They are both quite a bit bigger than Texas. Lakes per thousand square miles would be more interesting and meaningful. There is also the accessibility factor. Much fewer of the lakes in the Great North would be accessible than in the states. This was extremely interesting and comical in some parts. According to the 2010 US Census Bureau Wisconsin has a total of 11,339 square miles covered by water compared to 7,309 square miles for Minnesota. Most of that is Lake Michigan. If you discount the Great Lakes portions for both states, MN has about 2.6 MILLION Acres of inland water compared to about 1 Million for WI. That would be (MN) 4000+ sq miles of water compared to (WI) 1500+ sq miles. Content copyright Justin and Kristina Lapp. Theme images by merrymoonmary. Powered by Blogger.